Ariel Ward, a Medical Assistant at the Wichita Main Office and an Airman 1st Class in the United States Airforce, recently served our country on deployment overseas. 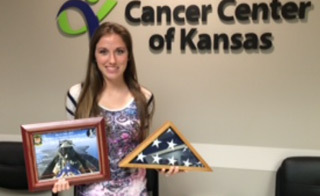 While there, she requested that the American Flag be flown on March 24, 2016 in support of Operation Inherent Resolve in a F-15E Strike Eagle for the Cancer Center of Kansas. Upon returning home, she presented the flag which was flown and framed certificate memorializing the event to CCK. We are humbled at her decision to honor CCK in this way and are proud to have her as a part of the CCK team. We also want to thank her and her fellow Airmen for their service to our country.